The College has another strong crop of athletes now making plans for Vancouver. Here’s the rundown. 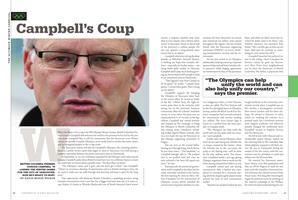 British Columbia Premier Gordon Campbell ’70 landed the Winter Games for the city of Vancouver. Now he’s ready to host. 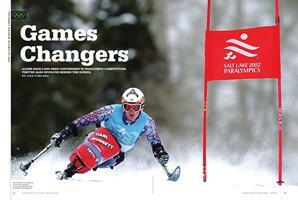 Scott Macartney ’01 hurls himself from the starting gates during the downhill competition at the 2006 Games in Italy. 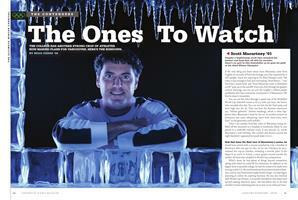 Since 1988 former Olympian Jeff Hastings, TU’90, has been network television’s ski-jumping expert. Here he offers the view from the booth. The U.S. hockey team—with five alums on the roster—plays Switzerland at the St. Moritz Games in 1948. The thrill of victory. The agony of defeat. Eighteen alumni athletes look back on their Olympic experiences. A two-time Olympian reflects on the meaning of medals—even to those who don’t participate in the Games. For decades young local skiers have received the gift of lift thanks to the Skiway’s deal with the town of Lyme, New Hampshire. A downhill ski-team washout remembers how coach Al Merrill turned him into a cross-country champion. Kristin King ’97 (right) sends the puck past Swedish goalie Kim Martin in the first period of the women’s hockey semifinals in Torino in 2006.